In regions throughout the US, foundations and philanthropic groups convene panels, conduct webinars and interviews, create press releases, and develop various multi-media products to showcase the impact of philanthropic investment in Black communities. 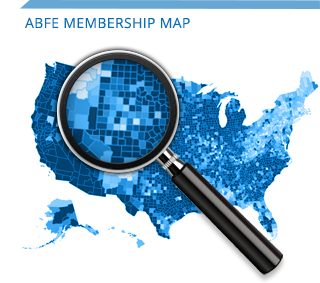 In this section, ABFE has compiled a growing list of these products to document the evolution of Black male initiatives in philanthropy and to highlight data of particular interest to members and colleagues throughout its networks. The expansion of our Knowledge Center is made possible in part by contributions of our members and affiliates. 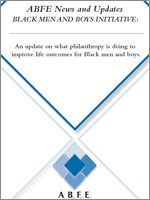 An update on what philanthropy is doing to improve life outcomes for Black men and boys. 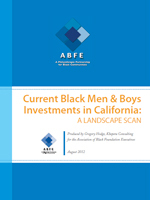 In this special issue of ABFE News and Updates, we take a look at the field of philanthropy’s investments and work around improving life outcomes for Black men and boys since the first meeting in 2006. For insight and perspective, we spoke with Shawn Dove, Campaign Manager, Campaign for Black Male Achievement, Open Society Institute; Tina Gridiron Smith, Program Officer, Lumina Foundation for Education; George L. Garrow, Jr. , Executive Director of Concerned Black Men – National Organization; and Carmen A. Anderson, Senior Program Officer, Endowments’ Children, Youth & Families Program, The Heinz Endowments. The report analyzes academic success indicators from national surveys that together give voice to nearly 5,800 pupils from schools across the country. “Breaking Barriers” suggests policy solutions that will assist policymakers, educators, school advocates, families and others in enabling African-American males to have greater success in the classroom and afterward. Read the report. 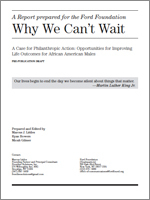 A Statistical Review of Grantmaking that Impacts the Lives of Black Men & Boys This report represents an effort to develop a common frame of reference for examining the disparate philanthropic investments that impact the lives of black males. 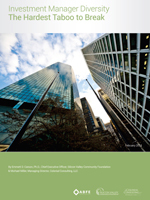 This work also offers observations and analysis that are (hopefully) informative and insightful for funders who are considering engaging in grantmaking with a direct focus on this population. 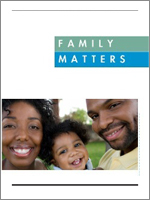 This Dellums Commission Report offers an approach for considering the question of how African American men affect the well-being of urban, poor, and distressed communities, and the well-being of their children, families, and neighborhoods. 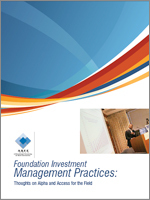 ABFE’s paper that outlines the barriers to diversity among endowment managers and provides appropriate, proven recommendations for greater inclusion of top-performing, minority managers. 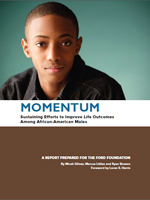 Momentum documents the efforts of the Ford Foundation and peer foundations across the country to kick-start dialogue and develop ways for philanthropic organizations to address the socioeconomic and health crises affecting African-American males and their communities. 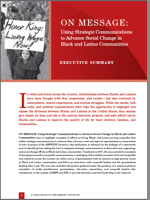 “ON MESSAGE,” is an ABFE-HIP report on using strategic communications to advance social change in Black and Latino communities. 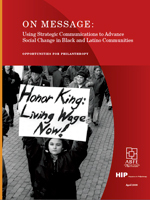 ON MESSAGE highlights examples of efforts involving Black and Latino-serving nonprofits that utilize strategic communications to enhance their advocacy work and improve opportunities in communities of color. Funded by the W.K. Kellogg Foundation, ON MESSAGE is informed by a nationwide scan to identify groups taking the lead to integrate strategic communications in their advocacy, organizing, and social change efforts in Black and Latino communities. Stepping Up and Stepping Out profiles examples of philanthropic entities that have stepped up by making investments with a specific intent to create opportunities for black males in their respective communities; and in doing so have stepped out on the proverbial limb. 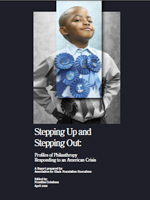 Highlighting three groups – A Legacy of Tradition, The Chicago Community Trust, and the Schott Foundation For Public Education – STEPPING UP and STEPPING OUT offers three distinct approaches to respond to challenges facing Black males in America. 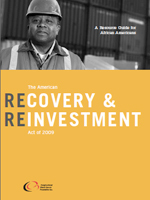 The Resource Guide on Recovery Act for African Americans is a resource guide for African Americans to highlight some of the major provisions within the American Recovery and Reinvestment Act of 2009 that are critical to their community. The ambit of this paper is the constellation of programs, policies and services that impact the well-being of Afro-descendant males in the United States. 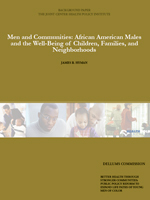 The authors intend to connect extant research efforts, policy initiatives, and community organizations explicitly focused on African American men and boys, and in doing so, suggest architecture for the relationships between these elements.